For SCBWI members living outside of London, it can sometimes feel like opportunities to meet industry professionals are few and far between. So when agents Amber Caravéo and Joanna Moult, of Skylark literary agency, suggested they’d like to get out of the City and into our SCBWI Networks we rolled out the red carpet. Amber talks here, to Marie Basting, about her tour of the networks and offers some great advice on how to get an agent excited and make your submission stand out. Q. 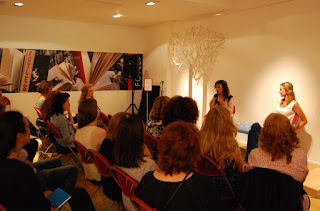 The Skylark tour will take you and Joanna out to meet writers all over the country. Why have you decided to get out of London and invest the time in this? Jo and I were very aware that most publishing talks, seminars and workshops are London based. There are lots of great writers who don’t live close to the capital and who don’t find it easy to get into London for these events. Therefore, as part of our aim to support talented new children’s authors, we decided to try to go to them! Q. Tell us a little about the tour so far and the kind of issues that writers have asked you about. So far we’ve been to Chichester, Bristol, Exeter and Shaftesbury – with further visits planned to Manchester, Kendal, Wolverhampton and Edinburgh. The main thing that every budding author wants to know is what are agents and publishers looking for and there is no easy answer. Every publisher wants something different and it changes all the time, so what they’re looking for now will not be the same in 3 months’ time. Also, often the ‘next big hit’ comes out of left field and nobody was asking for it or saw it coming but everyone falls in love with it nonetheless! This is why we always advise authors to write from the heart and write something they love. That way it will be unique and truthful and far more likely to appeal to agents and publishers alike. Skylark in Exeter: "The Skylark visit has been our most successful and popular Exeter event so far. Our members loved meeting Amber and Joanna, the talk/Q&A worked for everyone - unpublished, published, agented or anywhere in between - and there was the brilliant bonus of member 1-2-1s." Lesley Moss - Joint SCBWI SW Network Co-ordinator. Q. Offering manuscript reviews is a pretty resource intensive process. Why do you feel it is important to offer this type of support to writers? Funnily enough, it wasn’t something we had planned to do, but then organisers at several different events asked if we would be willing to do one-to-ones. We don’t offer this service as a general rule because, as you’ve pointed out, it’s time consuming and we have an agency to run, but while we are on tour, and since the whole purpose of the tour was to support authors, we felt that if this was something writers wanted then we would be happy to oblige. It is time consuming as there is a lot of preparation to do so that we can talk usefully about the writers’ work during their one-to-one sessions, but it’s very interesting for us to see what people are working on and hopefully the authors we’ve met with have found it helpful. Q. Are there any common pitfalls that novice writers seem to fall into when submitting their work? The most common one is not properly researching the agencies they’re contacting and not checking the submission guidelines. For example, we commonly have authors submitting adult titles to us – and we are a specialist Children’s and YA agency! We also sometimes receive submissions that only include the first three chapters of the manuscript (which is what many agents request) rather than the whole thing (which is what we like to see). Of course, it’s not the end of the world when this happens, but it doesn’t make the best first impression. Q. There’s lots of writing advice out there about avoiding cliché and common tropes, yet some of the most popular children’s books do follow quite a formulaic process. Is originality overrated? What makes a submission stand out for you? We don’t feel that ‘originality’ and ‘formulaic writing’ are necessarily mutually exclusive concepts. There are many children’s series which follow a kind of ‘formula’ that they have established for themselves, but that doesn’t mean that there aren’t hugely original and creative ideas being explored and developed within those books at the same time. Sometimes originality is about using a cliché or trope in a new way! Books for younger readers in particular can use ‘formula’ to offer children a reassuring read that delivers the kind of reading experience they know they’ll like – thus helping them to develop a reading habit. As they become more confident readers, they will typically seek out more challenging, less formulaic stories – but both kinds of book have a place and are valuable. Even grown-ups enjoy ‘comfort reading’ sometimes. A distinctive voice or writing style will often make a submission stand out to us. 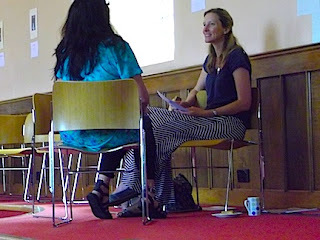 Skylark in Bristol - Amber and Jo share their expertise in publishing. Skylark in Bristol: “It was so inspiring to hear all about the ins and outs of children’s publishing direct from Amber and Jo. They generously shared their insights with the audience and then gave detailed feedback to nine local writers in the 1-to-1s. Everyone came away with fresh ideas and enthusiasm for their writing. It’ll be exciting to see what happens next.” Jo Thomas - Joint SCBWI SW Network Co-ordinator. Q. You're visiting Edinburgh on 20th August and then your next stop on the tour is Manchester. It was recently suggested to me that writers from the North have a darker edge. Do you think there are regional variations in writing style and the type of submissions you receive? That’s very difficult to say. Irish writers often seem to have a lovely lyrical style to their writing, but beyond that we haven’t noticed particularly clear regional variations. We’ll let you know if we change our minds after our northern tour dates! Q. Our last panel event in Manchester explored the worth of creating for children. What excites you most about the world of children’s books? How can our SCBWI members help to keep you excited? Children’s books are so inventive! Authors are free to explore almost any kind of world or idea or genre without being pigeonholed – as a sci-fi or chick lit author, for example – in quite the same way that writers for adults tend to be. I have always loved the imagination that goes into writing for children, and the sheer variety of books I get to work on! Jo says that she loves the idea that there is often one key book that will fire up a child’s lifelong passion for reading. What a treat to be involved in some small way in that magic! We find all this creativity hugely exciting and SCBWI members help just by continuing to come up with intriguing new ideas and sharing them with us! Jo and I both agree on ‘koala’ – mostly because they get to do lots of sleeping and eating! We like to think they have fun dreams. Skylark’s next network event will be in Manchester on Saturday 26 September when we’ll be talking more about the children’s publishing industry, the agent’s role and the submissions process. Bring along any questions you may have or let us have them in advance and we’ll build them into the discussion. You can also hear more from Amber at our SCBWI industry panel event at the Edinburgh International Book Festival on the 20th August. This informal Q&A session will take in the challenges of publicity, protecting writing time, and other unexpected bumps that authors may encounter as the industry continues to change. Amber Caravéo – Prior to founding Skylark Literary with Joanna Moult, Amber was the Editorial Director for Orion Children’s Books where she was privileged to work with a host of prize-winning and bestselling authors such as Caroline Lawrence, Liz Kessler, James Dawson and Holly Black. She has also worked as Senior Commissioning Editor for Random House Children’s Books and for Working Partners where she edited and developed the million-copy-selling series phenomenon, Rainbow Magic. Skylark Literary is a specialist literary agency that seeks and supports the very best in Children’s and YA fiction. Both Amber and Joanna are former editors from major publishing houses so the agency specialises in nurturing talented authors, helping each to find their voice and develop their writing skills. Skylark Literary is open for submissions and looks for true writing talent above all things. Come to Southend on Sea PLEASE! This is a great idea. You know Koalas do a lot of dribbling?! The tour sounds excellent, wish I could have made it to one myself. Thanks for sharing the feedback here and thanks to Jo and Amber for all their hard work. This is a great post, especially as it has reminded me I need to take a trip to the post box.See you in Manchester!